I see beauty all around me, from the patterned holes of a sapsucker in a birch tree, to a forest full of an unimaginable range of greens, to late afternoon sun glancing off the geometric grid of a skyscraper. I'm drawn to these patterns, textures, colors, and lines. A certain view, a snapshot in time, can catch my breath. My goal is not to recreate this beauty but to evoke the sense of interconnection, awe, and serenity that I find around me. Fabric is my blank canvas. I enjoy working with its soft texture, watching it come alive as I cut it apart and reconstruct it. I especially like the spontaneity and serendipity of creating colors by hand dyeing and discharging. The end product is always unique and always a little different from my mental image. The real magic occurs when these techniques all come together and produce something that goes beyond the predictable and express an emotion that hopefully can be shared by the viewer. Barb has just been juried into Quilt National 2017. Her work has been widely shown, including several solo exhibits. 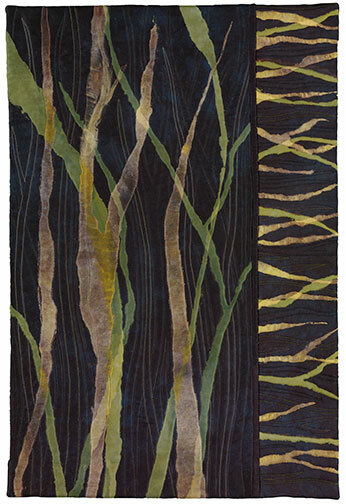 In addition to numerous regional juried exhibits, Barb's work been shown at the International Quilt Festival in Houston, the Rio Patchwork Design exhibit in Rio de Janeiro, Brazil and Quilts=Art=Quilts. Additionally one of Barb's pieces appeared as the cover and interior art of a college textbook. All text and images on this site are copyrighted and may not be used or reproduced in any way without the express written permission of the artist who created it.